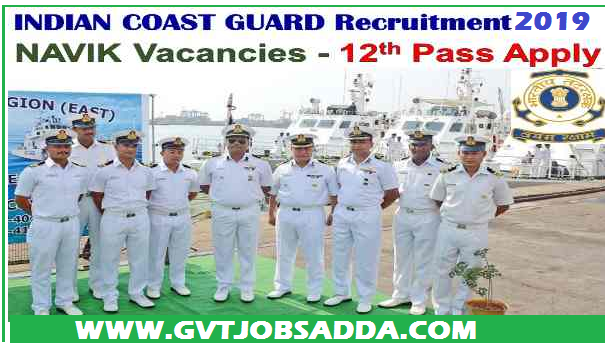 Indian Coast Guard Recruitment 2019 Applications are invited from male Indian nationals possessing educational qualifications and age, as prescribed below, for recruitment to the post of Navik (General Duty) in the Indian Coast Guard, an Armed Force of the Union. Those Candidates who are interested & Eligible for Indian Coast Guard Recruitment 2019 candidates should visit official website & read official notification And Apply Online. Brief Information About Indian Coast Guard Recruitment 2019 Has Given Below Interested & Eligible candidates can Apply Online Before Last Date. between 01 Aug 1997 to 31 Jul 2001 (both dates inclusive). Upper age relaxation of 5 years for SC/ST and 3 years for OBC candidates. Promotion and Perquisites : Promotion prospects exist upto the rank of Pradhan Adhikari with pay scale Rs. 47600/- (Pay Level 8) with Dearness Allowance. Promotion to the Officer cadre is subject to suitability and performance. Applications will be accepted ‘Online only’ from 21 to 31 Jan 19 till 1700 Hrs.Candidates are to logon to www.joinindiancoastguard.gov.in and click on opportunities button. Short-listing criteria will be based on higher percentage of marks for a particular examination Center. The qualifying cut off percentage(%) of a particular Center may be increased if more number of applications with higher percentage is received. Those who qualify written examination will undergo Physical Fitness Test (PFT) and the testing procedure will take about 2 days. Physically Challenged candidates are not eligible to apply for this examination. 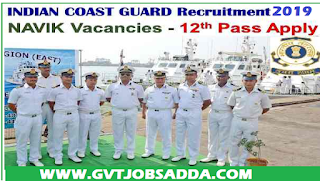 For More Details About Education Qualification Age Limit & Others Information Candidates Should Read Official Notification Indian Coast Guard Recruitment 2019 Before Apply Online.